Part 4. (1995 through 1997) The cover price is US$30.00. This book contains 138 pages. When an aerial shell bursts, stars that fail to burn are often said to be “blind stars”, or more descriptively as having been “blown blind”. This detracts from the beauty of the shell and contributes to debris fallout. The problem can be caused by any of a combination of factors; the most important of these are the degree of violence of the shell burst and the burn characteristics of the stars. Reprint Information: Number of pages = 3. Although appreciative audiences may value the predictability of fireworks, firefighters, unlike the king in The Remarkable Rocket, know that on occasion they may not be so reliable. When the first-due company finds it is dealing with fireworks, it is in an unusual situation that requires specific technical knowledge to ensure the safest possible outcome. Reprint Information: Number of pages = 12. A concussion mortar is a device used to produce jarring explosive sounds at events such as concerts and other theatrical productions. It consists of a heavy steel bar, drilled out to produce an explosion chamber. A type of pyrotechnic flash powder is loaded into the explosion chamber and fired with an electric match. Although concussion mortars are used quite frequently, for the most part, detailed measurements of their manner of functioning have not been reported in the literature. In the present study of concussion mortars, internal mortar pressure, recoil force and air blast were measured as functions of concussion powder load. It was determined that a full load (1 oz. or 28 g) of a strontium nitrate and magnesium concussion powder produced peak internal pressures averaging approximately 3100 psi (21 MPa). It was also observed that the width of the pressure peak ranged from approximately 7 ms for light loads, down to less than 2 ms for heavy loads. The recoil produced for a full load averaged approximately 5.9 lbf∙s (26 N∙s). The air blast for a full load, at a point 5 feet from and 3 feet above the mortar (1.52 m and 0.91 m, respectively), averaged approximately 1.5 psi (10 kPa). In addition, there were a number of unexpected observations, some of which have not been fully explained at the time of this writing. All pyrotechnic compositions present some hazard due to their ability to produce energy. However, some compositions pose an added hazard because of the combination of incompatible materials. The use of such compositions may result in more frequent accidental ignitions during processing or spontaneous ignitions during storage. Other compositions pose an added hazard because of their ability to produce especially large amounts of energy with rapid reaction rates. The use of such compositions is likely to result in especially powerful explosions in the event of an accidental ignition. This article attempts an organized examination of some combinations of commonly used pyrotechnic chemicals that are believed to have significantly increased hazard potentials. Reprint Information: Number of pages = 14. 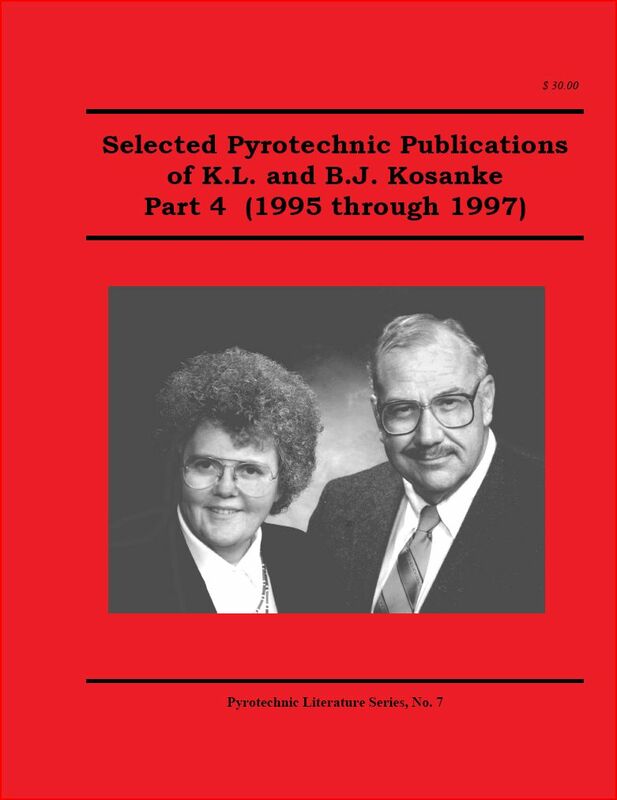 When investigating the cause of an accident, it was necessary to learn something about the lower explosive limit with regard to phosphorus content in Armstrong’s Mixture. A short literature search did not produce the needed information; thus a brief laboratory study was under-taken. Because the results of the study may be useful regarding safety and because they may be intrinsically interesting, this short article was prepared. Reprint Information: Number of pages = 2. Download for free pp 346-347. Aerial shell drift is defined as the difference between the ballistically predicted trajectory of a shell and its actual trajectory. It had been speculated that longer length mortars and capsule-shaped shells might experience significantly different drift than normal length mortars and spherical shells. While longer mortars propelled 6-inch (155-mm) aerial shells to greater heights, the average shell drift was unaffected. Further, it was found that 6-inch (155-mm) capsule-shaped shells probably drifted slightly more than spherical shells. Reprint Information: Number of pages = 5. Pyrotechnically generated sparks are probably the earliest augmentation of pyrotechnic burning for entertainment. While much is known about spark production both scientifically and as a craft, new effects and enhancements continue to be made. This review article presents a summary of the basic science of incandescent bodies, which establishes the range and limitations of possibilities for sparks. This is followed by a discussion of the pyrotechnic production of carbon and metal sparks, including control of spark duration and color. Finally, there are limited discussions of the control of corrosion of metal spark materials and control of spark branching. None of the standard laboratory tests for Black Powder provide a direct indication of its performance characteristics for propelling aerial fireworks shells. Typically such testing must be performed by firing dummy projectiles on a test range—with all the problems that can entail, including the use of fairly large amounts of Black Powder for each test sample. Accordingly, a small, inexpensive laboratory test apparatus was developed, which uses only a minimal amount of powder per firing. The performance of the instrument was quantified regarding the effect of operating temperature, sensitivity of output to variations in ignition point, the effects of combustion product accumulation in the bore of the apparatus, the effect of grain size distribution, and the statistical precision of the results. Following these characterizations, the instrument was used to evaluate the performance of a series of Black Powder samples. Reprint Information: Number of pages = 15. Download for free pp 366-379. In designing the most effective choreographed aerial fireworks displays, it is useful to know when, where, and how each shell burst will appear. To do this, in addition to aesthetic features like colors, etc., three aerial shell performance parameters are needed. These parameters are: time to shell burst after firing, burst height above the ground, and burst spread. It can be difficult and expensive to generate these. However, all three can be generated using a slightly modified video camera and videocassette recorder (VCR). Further, it will generally be possible to collect the raw information during the performance of actual displays; so there is no cost for the test fireworks. This article suggests a method to gather shell performance data. A variety of flash powders were tested under weak confinement to determine the sound pressure levels and tonal characteristics produced. In these tests it was found that: the sound output from mixtures prepared with potassium perchlorate from four manufacturers are essentially equivalent; there are significant differences in the level of sound output as a result of using six different common aluminum powders; the addition of either of two common flow or bulking agents have essentially no effect on the sound produced; the substitution of potassium chlorate for potassium perchlorate in a common flash powder has essentially no effect on the sound produced; and the addition of antimony sulfide or sulfur reduces the duration of positive phase without increasing the level of the sound produced. In short, it was found that nothing surpassed the level of sound produced by a 70:30 mixture of reasonably high-quality potassium perchlorate and a high quality flake aluminum powder. This is significant because the use of potassium chlorate, antimony sulfide, and sulfur, can seriously increase the sensitiveness of flash powders to accidental ignition. Reprint Information: Number of pages = 11. An interesting new fuse is being used on consumer fireworks, reloadable aerial shells. Some of this fuse appears quite similar to normal green Visco (hobby or cannon) fuse but with substantially different burn characteristics. Typical Visco fuse burns at a rate of approximately 0.4 inch per second; the new fuse product burns at a rate of approximately 3 inches per second. Further, under some circumstances, the fuse can burn at a rate of at least 9 inches per second. While there may be some interesting and useful applications for this fuse, its fast burn rate may also pose some considerable danger for an unsuspecting user. In recent years, it has become generally known that clusters of sparklers burn substantially faster than individual sparklers. However, little if any quantitative data has been presented in the literature. Toward that end, this brief article presents some data collected a few years ago by the authors. This brief article is based on my comments to the US Bureau of Alcohol, Tobacco and Firearms (ATF) concerning their classification of all flash powders as high explosives. In this query, I chose not raise the issues of flash powder storage requirements, quantity limits in process buildings, or any of the issues regarding bulk salutes. I omitted those subjects because I was not prepared to make specific recommendations on those subjects at this time. This article was written for publication because of the possibility someone would find this information useful or interesting. Reprint Information: Number of pages = 2. A collection of six commercial concussion powders were test fired in concussion mortars to determine internal mortar pressure, air blast pressure, and the duration of air blast positive phase. The internal mortar pressures for various powder types and load masses ranged from less than 200 to nearly 100,000 psi (700 MPa). For the same powder loads, the air blast pressures at a distance of approximately 70 in. (1.8 m), ranged from 0.07 to 1.7 psi (12 kPa). This corresponds to sound pressure levels (peak–ultra fast–linear) ranging from 148 to 175 dB, and relative loudness values ranging from 1.0 to 6.8. For the same powder loads, the durations of positive phase ranged from nearly 4 ms down to 0.7 ms.
Over the years, we have occasionally had the opportunity to conduct brief studies of fireworks rockets, both sky rockets and smaller bottle rockets. Most recently, an investigation was performed using some Horse Brand sky rockets (Glitterous Lights, Clustering Bees, and Flying Butterflies). This short article is written in the belief that a summary of those results may be of general interest. Reprint Information: Number of pages = 3. Download for free pp 415-417. In 1997, Obron Atlantic changed their German dark aluminum. (Their former product number was 5413; the new product was designated 5413 H Super.) We had published the results of a series of sound output tests of various salute powders, which included the effect of using various aluminums, including Obron’s old German dark. Because of our past work, and in response to a query on the Internet, we decided to conduct a brief investigation comparing the sound output of these two aluminum powders when used in a common flash powder formulation. This article presents those results. The ideal pyrotechnic is completely stable in storage and handling, yet performs its mission completely, with absolute reliability, upon demand. Many accidents in pyrotechnics are the result of unintentional ignitions during handling and storage. There can also be serious safety ramifications of ignition and propagation failures of pyrotechnic devices. This review article presents a fairly rigorous, but mostly non-mathematical discussion of the ignition and propagation processes. Reprint Information: Number of pages = 13. In recent years it has become generally known that clusters of sparklers burn at substantially greater rates than individual sparklers. However, except for a previous article by the authors, little if any quantitative data has been presented on this subject. As background information, that article contained a brief discussion of burn types and some factors acting to control burn rates. Any reader wishing to review those subjects can consult that article or two other articles presenting more complete discussions. The current article presents some data for 10-inch Red Lantern “Electric Sparklers” (colored sparklers) and discusses some aspects of consumer warnings and directions.